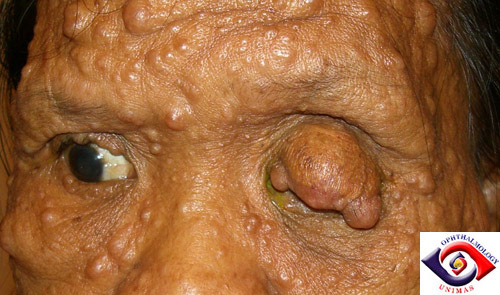 A 54 year-old woman with type I neurofibromatosis presented with a 3-year history of progressive left ptosis. She had no previous surgery or another history of note. On examination, she had a left complete ptosis with poor levator function. The eyelid (Figure 1 and 2) contained a rubbery mass that appeared to involve most of the upper tarsal plate with extension into the levator. Her vision measured 6/12 in the right eye and 6/18 in the left eye. Both vision could be improved to 6/9 with pinholes. The anterior segments revealed some Lisch's nodules in the iris. The posterior segment in both eyes were unremarkable. She was keen to undergo surgery to improve her appearance and to restore the vision. Figure 1. 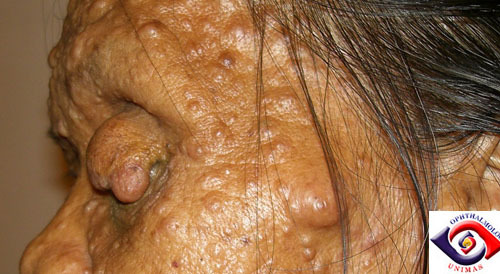 Picture showing multiple nodular lesions of the face and eyelids. Figure 2. Lateral view of the left upper eyelid. b. How would you excise the lesion and reconstruct the upper eyelid?